Please take the “View Larger Images” link above to see some pics with measurements. We are stocking these back protectors as an upgrade to certain 2014 and later AGV Sport jackets (please see those product pages to know whether this back protector is a recommended upgrade). All the photos in the gallery are of the size 001. Currently, size 001 is the only size available for use in AGV jackets. If your AGV jacket calls for size 007, please visit the Pro Back Insert page by taking the link below. The Forcefield Body Armour Super-Lite back protector insert is designed to be fitted to motorcycle jackets that have an existing body armour pocket. CE approved to CE EN1621-2:2003 Level 1 the Super Lite is extremely light, flexible and breathable. The upgraded Nitrex Evo® construction offers RPT (Repeat Performance Technology) to ensure the ultimate protection is given even after multiple impacts. 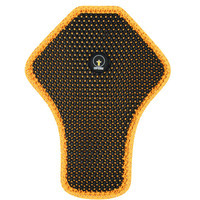 The perfect replacement back protector insert when available space and depth is limited.